One of my personal goals for the year is to simplify and redecorate my home and studio using furniture and accessories (and art) that I already have. Since I am fortunate to live near the Newport Bay and Pacific Ocean I wanted to give my home an updated coastal feel at the same time keeping the cottage garden look I love. . . and at the same time . . . staying on a very tight budget. I had my sofa, side chair and ottoman slip covered in white cotton denim at a 30% off sale and moved furniture and accessories around from other rooms in my home. 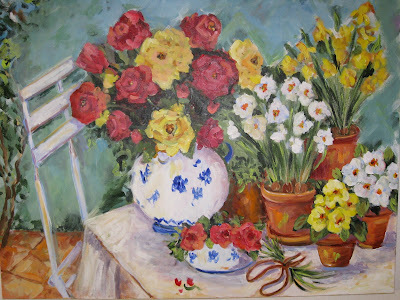 I added lots of blue sky and water to some of my existing paintings - and at the same time left the flowers to give them the new coastal cottage garden look. Let's take a look around and I will show you what I have been up to! In keeping with "it's not what you don't have - it's what you do with what you do with what you do have" philosophy of decorator and author Kitty Barhlomew - I decided to re purpose another one of my garden paintings to give it a coastal feel. First, I painted out the white bistro chair and began painting in the blue sky and blue ocean. I moved the yellow wicker chair from my office to the living room and wanted to add more yellow to the painting to pick up the color in the chair. I sketched in a white wicker chair using my own chair and throw cushions as inspiration. I felt the floral design on my yellow pillow was too much and competed with the flowers on the table and also that the angle of the chair was not right. I changed the angle of the chair and painted out the flowers on the pillow and painted the pillow a solid yellow. I paint outside as weather permits so I can really see the colors in daylight. Now that the painting is complete - let's take it inside and hang it over the fire place to see how it looks. Bentley, my Studio Assistant has been patiently waiting to get a first hand look! Looks like Bentley approves and is waiting for our next project! Thank you for visiting. I love to hear from you and it really means a lot to me that you have taken time to leave me a comment and to follow my blog. If you have any questions or would like to see me paint something special, please leave me a comment or send me an e-mail. Wishing you and your family a joyous and blessed Easter and Passover season. Your livingroom looks beautiful Erin and Bentley certlainly seems to love it as well. Your painting is beautiful...I love the ocean in the background. The painting turned out beautiful, Erin! Love your living room. You make it all look so easy! OH~~~~ Everything is so peaceful! Your paintings are just beautiful. I love the painting and thank you for including us in the process. I want to move into your house right now. It's so welcoming. I love the painting with the wicker chair in it as well as the "real wicker chair" moved to the living room! Erin, congratulations on the Country Sampler spread about YOU!!! It's wonderful! I bought it the other day, opened it up, saw your familiar touch on the canvases and thought to myself "I think I know her"! Sure enough, it's YOU! The article is so well-deserved. I'm thrilled that they featured you to show your special talents. Diane Knott's just posted bout the Country Sampler magazine and your article in it. I'M HAVING A 200TH POST GIVEAWAY IF YOU WANT TO COME ENTER THE DRAWING. Erin, your living room is gorgeous! I really love the denim slipcovered furniture. That is my all time favorite look! Your paintings are stunning and are perfectly at home in your living room. Gteat job on everything.